It’s that time of year again in the South, harvest time for our summer veggies. There is always an abundance of zucchini and squash at our house from my in-law’s garden. 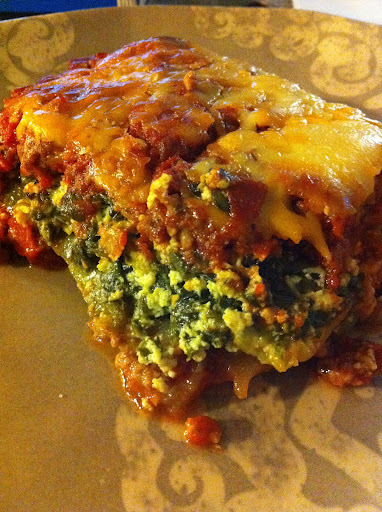 This lasagna replaces traditional noodles with zucchini and has a spinach and ricotta filling as well. And don’t forget about the spicy meat sauce. You won’t miss the noodles I promise!! The trick to not having a watery lasagna is salting your sliced zucchini. I used a mandoline and sliced my zucchini between 1/8th and 1/4 inch thick. Then I generously salted each layer and set them aside and let the salt pull the water out of the zucchini, about 30 minutes. Then all you do is pour off the water, rinse the zucchini and allow them to dry on paper towels and then use as you would lasagna noodles. As for the Spicy Meat Sauce, brown 1 1/2 pounds of meat and make my Tomato Basil Soup Recipe minus the heavy cream and add an extra 1/4 tsp of red pepper flakes. You can also add mushrooms and onions or other veggies if you like to the sauce. This recipe makes a lot so plan on leftovers and I don’t think anyone will complain! Brown meat and drain excess fat. In a separate bowl, combine the chopped spinach and ricotta, 1/4 tsp salt and dash of nutmeg. In a 9×13 pan, lay down 1/2 the meat sauce, then 1/2 the zucchini (slightly overlapping, covering entire pan), then all of the spinach ricotta mixture then the other half of the the zucchini (slightly overlapping, covering entire pan) then the remainder of the meat sauce. Top with your favorite cheese. This is great! I used cashew ricotta and it was wonderful. For the Zucchini noodles I lay them out on a cookie sheet on parchment paper and bake 350 for about 15 min. (In a single layer) It works great and you can skip the salt step. Thanks!